Traders look at charts trying to find patterns that help them identify the trend. Because patterns are difficult to spot, many traders add indicators to their charts. The goal of any indicator is simple. Traders use indicators because they want a simple formula to forecast price moves. That’s why there are hundreds, if not thousands, of indicators. Traders are always tweaking established indicators, looking for an edge. The result is a dozen different kinds of moving averages, and hundreds of tools that claim to measure momentum. Of course, very few of these indicators provide useful information. Not surprisingly, the indicators that are popular aren’t very useful. It’s the indicators few traders follow that offer valuable information. One indicator’s last sell signal came at the end of January. That was the exact day the S&P 500 Index peaked. Now, we are getting the first buy signal since that decline. Among the most useful indicators is one known as the “VIX Fix.” It’s at the bottom of the chart below. And it just gave a buy signal. The VIX Fix is the solid blue line at the bottom of the chart. 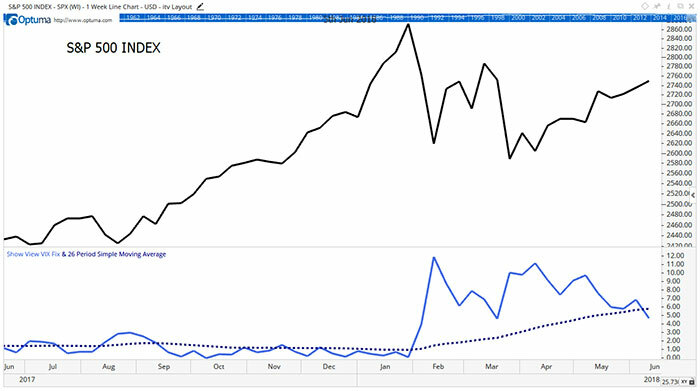 It’s like the CBOE Volatility Index (VIX), the widely followed fear index. Both indicators increase when prices fall. Both decline when prices go up. The dashed line is the moving average of the indicator. When the indicator tops the moving average, that’s a sell signal. That’s because fear is rising, and traders with fear tend to sell. Buy signals occur when the indicator falls below the moving average, which indicates traders are losing their fear. The VIX Fix measures how close the current market price is to the lowest price of the last few weeks. When prices are in uptrends, the close is usually near the high. But prices close near the low in downtrends. This indicator works because it’s based on how traders behave. The calculation fixes some of the problems with the VIX. Plus, the VIX formula is well-known, and it could be manipulated by a large trader. In the past few months, concerns that the VIX is being manipulated grew. But since the VIX Fix reflects market action, it can’t be manipulated. The close is the most important price of the day because that’s what traders use to calculate gains and losses. If their losses are too large heading into the close, they will sell, pushing prices lower. When they have gains, they can increase their exposure to the markets. That buying pushes prices higher into the close. The moving average shows us the average value of the VIX. When the indicator crosses the moving average, we get a trade signal. When the VIX Fix moves above the average, it’s telling us that fear is above average, and that is the time to sell. When fear drops, the indicator gives a buy signal. It’s telling us buyers are coming back into the market. The chart shows the signals tend to last for several months at a time. That means this is a low-risk time to add some exposure to the stock market. The VIX Fix is telling us we are finally in the middle of a tradable rally. Longer term, a bear market is likely. But for now, it’s likely the next 100 points in the S&P 500 are up.